A live recording from December 1981 featuring Andy, Brian, Clive & Geoff, issued as our first CDR in 2005. It was one of only a handful of gigs done with this 4-piece line-up. This CD is also available with our release “Smiling At Grief – The Definitive Edition”. The concert was recorded at the band’s then favourite venue, the Target Club, in Reading – scene of the instrumental live album – and has significant ‘rarity’ value because of the line-up. 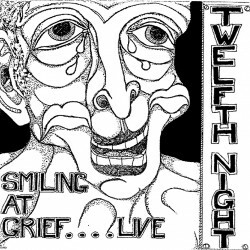 It was one of the only four gigs that we did as a four-piece with Geoff (but without Rick) in the period after recording Smiling at Grief (Nov 81) and disappearing into the studios to record Fact & Fiction (which took up most of 1982). It features both Clive and Geoff playing keyboards (‘2 fingers’ in Geoff’s case) – with Clive doubling up on Bass as well. Whilst the quality and the ‘mix’ is not perfect it is interesting in that some of the tracks are the final versions (as released on albums at the time), some have subtle differences, and others are quite different. Overall it shows a band in transition, trying new songs/styles and to accommodate an enigmatic front-man, who was in turn learning his role too!